A year ago, on July 8th, a female Border Collie named Spice gave birth to a litter of (as I recall) five puppies in Pensacola, Florida. Nine weeks later one of them won my heart when she was the first one to run over to me in the breeder’s back yard. This particular puppy was inquisitive, energetic and affectionate. I wrote the check to the breeder, lovingly placed the pup in my oversize dog crate positioned in the back of my car and we began our journey through life together. But first the unnamed puppy gave me a preview of what was to be her worst training problem. She, to put it not so delicately, crapped all over the crate and herself. Tommie Girl turned out to be one of the most challenging dogs I’ve ever house trained. When she had to go, she just went. Quickly she learned it wasn’t to her benefit to soil her nighttime plastic Vari-Kennel crate, her den. But she didn’t make the den (no potty) connection when she was in her daytime exercise pen. Around Christmas the light went on over her head; potty in the x-pen and the old lady raised her voice saying no, no bad dog. Now Tom’s allowed to be loose in the house, having learned that if she whines pathetically she is let outside to pee or sniff or play. I soon realized she was training me as much as I was training her. But overnight free roam privileges haven’t been earned yet. One test revealed that her pathetic whine is useless when I’m deep in dream land. She got bored and antsy and, oh what the heck, crapped inside. Oh, no, no bad dog. She has been demoted at night back into the Vari-Kennel. Tommie’s play training started immediately. How could I not spend hours touching her fluffy coat, smelling her puppy breath and looking into her questioning eyes? I fretted about doing everything right. Was I doing too much training or not enough and was I giving her the right amount of food and rest? It had been two years since I raised the last puppy. How soon we forget. 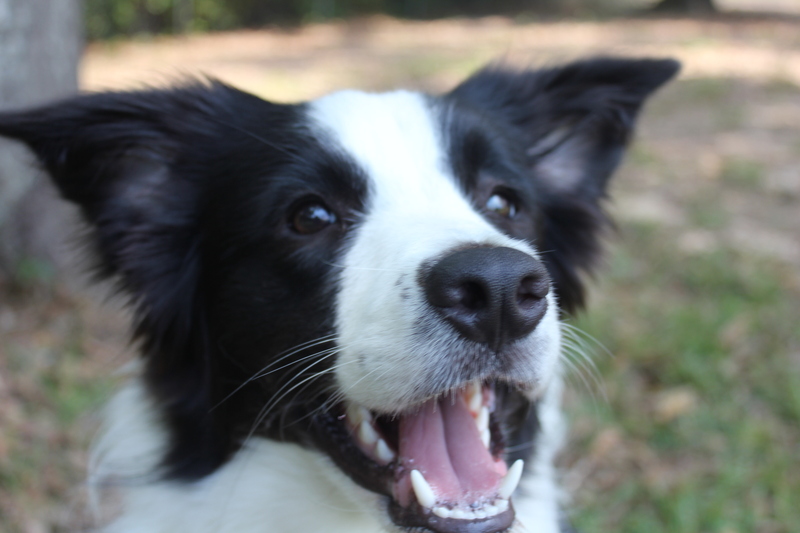 I fretted over balancing Levi’s sharp nips when he taught Tommie the Border Collie pack rules and etiquette, as well as Catcher’s overzealous playfulness with the small newcomer. Tommie’s formal obedience training has been nothing short of a blast. She has picked up on advanced skills with no problem, and works and plays at full speed. She’s been in a few show training matches and keeps her attention on me, happy to play with her toys and do her games (cloaked as obedience exercises). She is no doubt going to follow in Levi’s footsteps in the obedience ring. That means I can expect a lot of fun at shows, as well as frustration when, in her exuberance, she adds a twist to the running, jumping, retrieving exercises, a dog that makes obedience look fun and easy. Tommie has learned how to walk in tandem with Catcher at shows and how to behave in hotel rooms. She follows Catcher’s example, the mature dog teaching the young, as it should be. I don’t speak dog. There are things a young dog needs to learn from their own kind. I have used an older dog to help me train puppies since the 80’s, a monkey see, monkey do form of education. The only remaining problem for me to deal with is Tommie’s heat cycle. Decades ago vets suggested we allow a female pup to have one heat cycle before being spayed. Now pups are spayed as early as five months. Recently on Facebook there were postings about ongoing canine medical research on certain breeds suggesting female dogs could possibly live longer and have less chance of getting cancer if they were spayed as late as seven years of age. Oh, no, I’m not waiting that long, too much trouble. I’ll allow her one heat cycle and then she is off to the vet’s to earn temporary status as a Conehead. Alas, each day I think Tom is in season, maybe, not yet, yes, no. A breeder said after Tom blows her coat it’s a sign she’s getting ready to come “in”. One look at my carpet and there’s evidence we’ve reached that stage. But no bleeding yet and so far, no intact male dogs trying to jump the fence. Pretty soon I’m going give up and make an appointment with the vet. If he says she’s okay to be spayed then in the back room she goes. I’m not a breeder and have no intentions or delusions of becoming one. Afterwards I face ten days of keeping her quiet, no running laps, no tussling with Catcher and no obedience training. Suddenly it seems the time has slipped through my fingers and Tommie (AKC name Claudia’s BFF) is twelve months old. I call her my mini-Levi because she matches Levi’s energy. The two of them run laps together around the back yard, one young, one old, but together a blur of stretched out legs and wind-blown black and white fur. They often collapse under a nearby tree, tongues hanging out, their lips pulled back so it looks like they are smiling. Then the more sedate Catcher joins them under the tree. Minutes later Catcher and Tommie are rolling over and over, Catcher growling gently, giving the pup more lessons in play etiquette. Occasionally I’ll stop and recall how this scene has played over and over again, daily, monthly and yearly. The dogs age, one dies, then another arrives to take its place, learning once more the game of running and playing in the grassy field. In my mind I see the former Border Collies who have relaxed under the same tree. Now it is Tommie’s turn under the tree, to be one of what I call the Pine Forest Border Collies. I’m looking forward to the next twelve months with my Tommie Girl and the path she will take me. 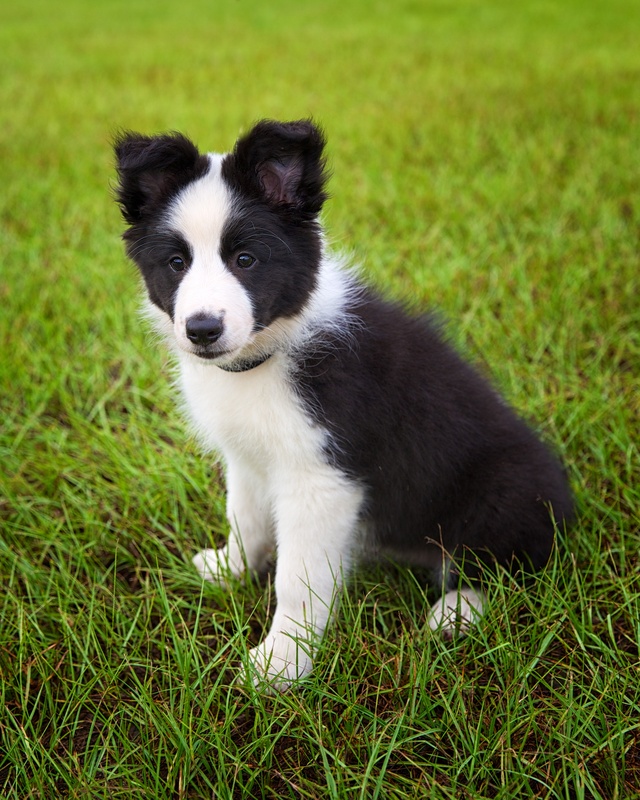 This entry was posted in border collies, dog obedience, Dog training, Dogs, memories, Puppies, Retirement Life and tagged Border Collie, Border Collies, Dog, dog obedience, Dog training, Obedience training, Pets, retired life. Bookmark the permalink.